In a world where malicious intruders are always probing networks in search of weaknesses to exploit, you cannot afford to ignore any vulnerability, misconfiguration, or weak security control in your network eco-system. The security problem is further compounded by the increased use of remote access to networks via wireless technologies which have opened more opportunities for malicious intruders. The convenience and ease of access to networks brought about by wireless communication have also made it easier for hackers to penetrate your information security system. An organization that doesn’t have a secure wireless system configuration will not detect, prevent, or control unauthorized network access. You need to conduct a wireless security assessment to determine the strength and efficiency of your wireless security settings and configurations. At Venkon, we have extensive experience in wireless security assessment services. We identify vulnerable access points and rogue hardware, analyze your wireless system’s security configurations and run penetration tests to detect vulnerabilities in the wireless infrastructure and assist you in implementing effective security policies to prevent risks. Our wireless security assessment service is designed to address all the security challenges faced by businesses and organizations that rely on wireless technology in communication, financial transactions, and other business operations. Wireless technologies pose a significant threat to your IT infrastructure because their signals reach beyond outside physical boundaries and can be difficult to control. Without proper configuration and with weak security protocols, wireless connections are not only easy to access but they allow unauthorized eavesdropping too. At Venkon we rely on the latest techniques to assess wireless networks for weaknesses and vulnerabilities. By identifying, evaluating and understanding existing vulnerabilities, our team of IT security professionals will help you come up with the right solutions and secure your information assets. Our team of experts will examine all your wireless network access points, identify vulnerabilities and weaknesses in the network, and evaluate the overall exposure of your business to wireless network risks. We’ll then recommend the best measures to take in order to secure your business against internal and external attacks. Identification of Active Wireless Networks. We’ll run an active penetration test to determine the vulnerability of your network to a hacking attempt by an attacker using wireless access. We’ll determine the potential location and range of wireless networks, their configuration information, and test points of entry to identify access parameters. Evaluate your wireless implementation for potential weaknesses and vulnerabilities. Our information security experts will assess the measures you’ve already taken to secure the infrastructure and manage access to your network. Exploit vulnerabilities and test other networks. We’ll use vulnerabilities we had previously discovered to test your other network segments. The goal is to identify which network segments can be used as a launching point to attack your network. Venkon’s information security experts will evaluate your current state of wireless security implementation, all your wireless assets, potential vulnerabilities, and configuration standards. Our wireless security assessment services are designed to help you plan, implement, and run a secure wireless network using a safe and sound architecture. What is Wireless Security Assessment? A Wireless Security Assessment is a process that helps you validate your company’s wireless security controls to establish the degree of your wireless network’s susceptibility to an attack. The findings we provide after the assessment along with our technical remediation advice will help your organization to plug security loopholes in your wireless network and beef up security against future attacks. A wireless security assessment will also help your organization to meet the requirements of IT compliance regulations such as PCI DSS, GLBA and HIPAA. What does the Wireless Security Assessment process involve? 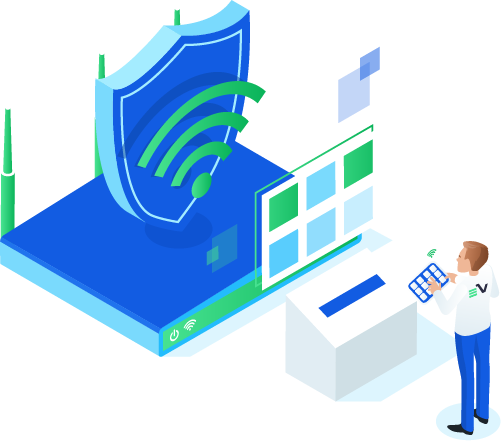 A Wireless Security Assessment process involves identification and prioritization of vulnerabilities in your wireless network followed by a recommendation on the best remediation action plan. The goal is to protect your critical data assets and enhance the overall information security of your company or organization. Basically, we assess your wireless network’s security by running non-invasive data collectors with the goal of analyzing your network for security weaknesses. Do you provide reports or guidelines after the assessment? After the wireless security assessment is completed, we’ll provide you with the following reports: •	Detailed Wireless Security Assessment report •	A Wireless Security Policy assessment report •	Executive Summary report •	Outbound security report detailing deviations from industry standards in your wireless networks We’ll also provide you with our own expert guidelines and recommendations on how you can enhance the security of your wireless networks and devices. Contact us today to learn more about our wireless security assessment service and how we can be of help to your organization.